We’d love your help. Let us know what’s wrong with this preview of Nothing Left to Steal by Mzilikazi wa Afrika. This tell-all memoir reveals the details behind Sunday Times journalist Mzilikazi wa Afrika’s exposure of the R1.7 billion lease scandal between police commissioner Bheki Cele and property tycoon Roux Shabangu, for which he was infamously arrested in 2010. It is also the riveting account of how a neglected boy in an unknown village became one of South Africa’s most awarded This tell-all memoir reveals the details behind Sunday Times journalist Mzilikazi wa Afrika’s exposure of the R1.7 billion lease scandal between police commissioner Bheki Cele and property tycoon Roux Shabangu, for which he was infamously arrested in 2010. It is also the riveting account of how a neglected boy in an unknown village became one of South Africa’s most awarded investigative reporters and found himself at the receiving end of the corruption that had defeated those he helped put in power. Fearless in the face of corrupt authorities with sinister political motives, and fervent about justice, Wa Afrika’s life was characterised by resistance to oppression and inequality from an early age. Destined to defend and uphold the principles of democracy, his story is the inspiring tale of an ordinary man, armed with a pen, who challenged the proverbial giant. To ask other readers questions about Nothing Left to Steal, please sign up. Woooh..amazing i just met Sunday Times journalist Mzilikazi at my place of work Capital radio- Kampala, Uganda. My question: His first book was such a bomb! Should we expect another one? 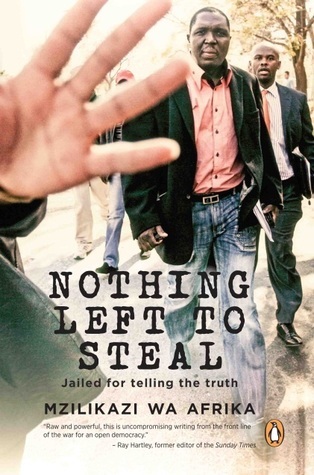 Anyone thinking of reading this book should first check out https://www.noseweek.co.za/article/27... from six years ago, pointing out the fact that Mzilikazi wa Afrika and his colleagues were taken in by corrupt gangsters who wanted to stop good cops bringing them to justice. These so-called "investigating" journalists were interested in the scoop and not in the truth. And these journalists got an international award for their journalistic "expertise" on this appalling reportage, which has been Anyone thinking of reading this book should first check out https://www.noseweek.co.za/article/27... from six years ago, pointing out the fact that Mzilikazi wa Afrika and his colleagues were taken in by corrupt gangsters who wanted to stop good cops bringing them to justice. These so-called "investigating" journalists were interested in the scoop and not in the truth. And these journalists got an international award for their journalistic "expertise" on this appalling reportage, which has been proven to be grossly defective and which has led to honest hard-working civilians losing their livelihoods! I believe that international award should be rescinded (but maybe it won't because wa Afrika sits on the Board of the organisation that gave him the award). I've had an early look at this book, which is due for release in August 2014. Full disclosure: Mzilikazi was on my investigations team when I was editing the Sunday Times. It is the story of the making of one of South Africa's top investigative journalists and provides riveting and, at times, disquieting, view of what it takes to break the big stories in a country struggling to establish itself as an open democracy. It is an environment where journalists face aggression and threats from the corr I've had an early look at this book, which is due for release in August 2014. Full disclosure: Mzilikazi was on my investigations team when I was editing the Sunday Times. It is the story of the making of one of South Africa's top investigative journalists and provides riveting and, at times, disquieting, view of what it takes to break the big stories in a country struggling to establish itself as an open democracy. It is an environment where journalists face aggression and threats from the corrupt and amoral power-mongers who seem to dominate public life. In the subtitle of one of the editions to this book we read that the author was "jailed for telling the truth". Well, he and his colleagues have certainly been exposed for not telling the truth: https://www.news24.com/SouthAfrica/Ne... Read this book with care - the truth s not the prerogative of journalists looking for the scoop. Is it likely, one wonders, whether Stephan Hofstatter, Mzilikazi wa Afrika, and Rob Rose will emulate this act of honest conscience and return the "Global Shining Light Award" which they won for their work falsely described as having "exposed how a police unit operated as a hit squad by executing crime suspects while claiming to be acting in self-defense" [ https://gijn.org/2013/10/16/global-sh... ]. Their work on this project has been proven to be grossly defective [ see, for example, an early warning of this at - https://www.noseweek.co.za/ article/2714/KZN-death-squad- controversy - quite apart from recent court actions and admissions confirming the errors and deficiencies of the journalists ]. Their deficient "investigative journalism" was also hugely damaging to the lives of innocent people while boosting the work of gangsters and criminals. The three journalists, being more interested in a potential "scoop" than in "investigative journalism", played into the hands of gangsters and corrupt police officials, who helped them spin a tissue of fabrications and lies that led to the demise of one of the country's best police units, along with a concomitant escalation in crime as criminals rejoiced. This wanton destruction arising from the journalism in question spilled over to such an extent that, it has been justly claimed, the three journalists were empowered to go further and, in so doing, to play a crucial role in supporting the capture of the Zuma State [see video and commentary at https://www.news24.com/SouthAfrica/Ne... ]. This "State Capture" has caused billions of rands damage to the South African economy, while destroying the lives and livelihoods of honest hard-working civil servants. The deficiencies of the "award-winning" journalism has also been ADMITTED by one of the journalists [ https://omny.fm/shows/mid- morning-show-702/is- journalist-stephan-hofstatter- genuinely-contrit ] but, to date, despite acknowledging his grievous faults, he has not returned his award. Neither have his colleagues. All three of them, however, have launched books on the basis of their dubious claims to be truth-seeking investigative journalists. Thoroughly enjoyed reading this book! I must say, i love how he tells the story, you feel like you a part of it, walking and hiding with him in the wilderness! After reading the last sentence of this book, my first thought was "WHAT A LIFE"!!! A person with so much passion for his craft; definitely what we should all aspire to! This book is well written and the play on words is amazing; a telling trait of being a journalist... WHAT A LIFE! A sad reflection on the endemic corruption widespread in the upper ranks of South Africa's ruling African National Congress party. Despite the valiant efforts of investigative journalists such as Mzilikazi wa Africa, such transgressions are largely ignored and, even where cases are finally dragged kicking and screaming before the courts, they are usually dealt with by reassigning the perpetrator to another position where the theft of monies and property continues. A disturbing reflection on the S A sad reflection on the endemic corruption widespread in the upper ranks of South Africa's ruling African National Congress party. Despite the valiant efforts of investigative journalists such as Mzilikazi wa Africa, such transgressions are largely ignored and, even where cases are finally dragged kicking and screaming before the courts, they are usually dealt with by reassigning the perpetrator to another position where the theft of monies and property continues. I probably had high expectations due to media hype. I found the self-praising and pitying a bit too much.